3. Check Settings & Sync-Check camera settings and make sure it's ready for a wedding. We also make sure that the camera bodies are sync'd so that when we're editing, the time stamps match up. 4. Pack the Gear-Camera bodies, lenses, cf cards, batteries, tripod. It's all packed and ready. Plus a tote bag with snacks (usually nuts) bottled water and a sweater). You do not want to do this on the morning of, when your mind is racing in a million directions. Get this done the day before when you are calm. If you forget anything, you'll have time to remember. One of my friends actually forgot to pack her cf cards in one of her early days, and she had to collect tiny cf cards from amongst the guests in order to get through the ceremony (until someone brought her cards to her). How embarrassing! 5. Review the Timeline and Photography Gameplan-There shouldn't be any more questions at this point (it's a little late to try to change something the day before the wedding) but go ahead and take the time to review the details, portrait lists, names and details. Figure out what time you are leaving the house and set the alarm clock (and a backup) accordingly. This should not be the first time you look at the timeline, because you may need to adjust timing for portraits and so forth, but that needs to happen no later than a week prior to the wedding. After that, plans become finalized. 6. Take the Evening Off-You want to be well rested and relaxed prior to a wedding shoot, so get everything done in the afternoon so you can take the rest of the evening off and relax. Be sure to get plenty of sleep, you want to be at your sharpest on the wedding day. Is there anything you do the day before a wedding? Hi there – I was wondering, I’m not a wedding photographer but am a photographer who is getting married and know that I’m going to be a pain in the proverbial for the photographer that we eventually hire… my question is… what would you note as the definitive shot list for a wedding? Scene: we are getting married in a small castle in Ireland, 180 people, green is the colour scheme and I’m super excited about the photos (as well as everything else!). Also, anyone know any good photographers in Ireland? sounds like your wedding is going to be AMAZING!!!! I would hire a photographer that works in the style you prefer-so if you want lots of candids from the reception, you want to hire a photographer that shows that type of work in their sample albums. If you want gorgeous setting type portraits, with strong lines and beautiful backdrops behind the couple, hire a photographer that shows lots of that on their website. 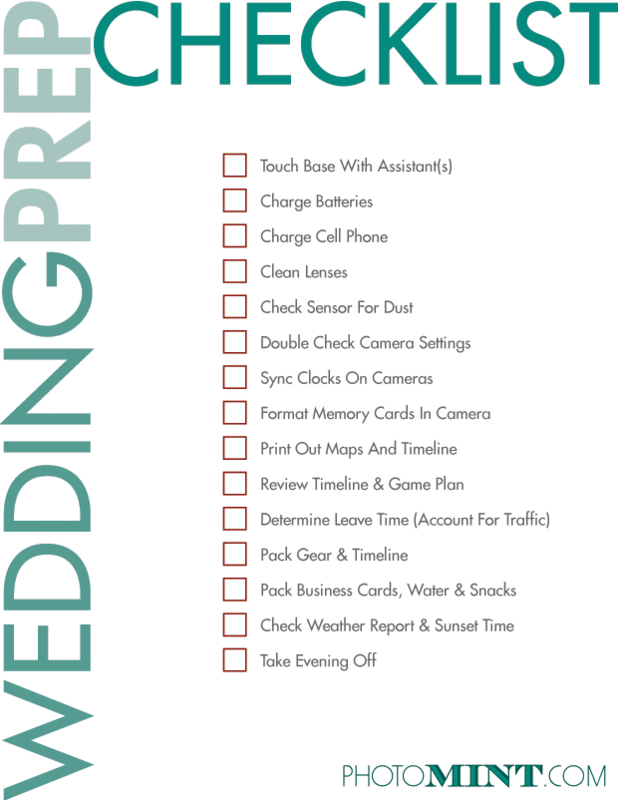 I would tread carefully in using a shot list-these can be helpful for newbies that don’t know their way around a wedding, but a pro is only going to be slowed down by it-taken out of the moment and into a checklist mindset. But of course, tell them what you care most about, and go over the timeline in detail so they know what to expect. One of my fav photographers is Jeff Ascough in Lancashire. Many thanks for your good infos. great advice Ryan, I like that idea! Great article. From my lesson learnt, always check the health of the battery. I found that one of my batteries first drop to 800 (usually 1200) shots per charge. The next recharge, it dropped to 300. On the third recharge, it dropped to 0! It take 3 weeks to order a new battery. So, always check battery life and order replacement well in advance. I’ve dealt with rechargable batteries for several years. What I do is mark them with a blank sticker or write on the battery itself if it is draining/ not performing as it should. That way I know which one to keep an eye on for per performance. Plus, if it goes down even more, ASAP replace it, and throw it in the trash once the new one shows up. I recently bought a DSLR and for some reason, it keeps going into video replay mode, and posting it to the LCD screen, even when I manually choose the EVF. I went through two battery packs in one day. They next pay day, I bought two more batteries, and I keep checking the camera to see if it goes into replay again. Once it does, I power it off. I always try and charge my batteries two days before, once I had a power cut the night before the Wedding luckily I had enough batteries charged but it taught me to always prepare well ahead. I also make sure I have put all the details into my Sat Nav the night before, and always take a bottle of water. It is easy for us to become dehydrated as once we start we don’t stop! great advice Lindsay. I always have a bottle of water with me as well, and typically a bag of trail mix for protein. Great point. I had a power outage the day before one time also. That is also why I added a battery charger I can plug into my car. I actually have a check list like this only much bigger. My check list has every item we take right down to my wallet, cell phone, client file and even a check to close the garage door! So, when I back out of the garage I stop the car and check off every item on the list before leaving the driveway. Hi Greg. Would you mind sharing your checklist? I’ve been looking for a detailed one that I can use to cater to our needs in our business. Thanks in advance! Some cases yes! (The walls are red/wine too) Any suggestion for times when i’m unable to bounce it off the wall? do test shoots before the wedding day. A colored wall may add a color tint to all your pictures. Talking about scouting the venue. I have an event coming up, and the ceiling is all glass. If i bounce my blash off it will it affect my pictures?Please help!!!!!!!!!!!!!!!!!!!!!!!!!!!! Can you bounce the flash instead at a wall? I normally check the car (enough petrol), location maps and parking availability in the area (thanks to Google Streetview!). The last thing I want on the day is to drive around in a search of parking space. those are great additions Oleg. Nothing worse than to be running a little behind only to jump in the car and find it on empty. I have my first wedding shoot coming up in three weeks. i’m going to follow your advice on shooting a wedding, i know its going to help me. You are welcome Aiden, please let us know how your wedding goes. thanks PhotoMint your business advice is incrediblly helpful and I will be checking back every day. It is hard to have a good sleep before wedding shot. It is so exciting. I know what you mean. I think it’s that way for all photographers, regardless of how long you’ve been doing it. I know EXACTLY what you mean! Wedding photographers are a very excited bunch! Knowing that you are all prepared and have a checklist helps me sleep! Thanks for this advice tip. I just came across your photography blog, I’m just starting out myself-so this is perfect, I’m going to bookmark this site. I dont think I’ve come across anything else that focuses on the photography business side of things. Thanks John, I’m glad you are enjoying the material here-that’s exactly why we started this-there is so much education available on the technical side of photography, but the business side? Not much. You should sign up for the email list, we’re going to be giving away a really great book in about 6 weeks. Matt, that’s great advice, thanks for adding that to the list! Great point. I forgot this once. Luckily, I figured it out after my first shot. I love instant review! That shot I figured it out on was the bride getting into the car. (No second take available!) My ISO was too high. Luckily Lightroom was able to save it.